At its peak from about A.D. 800 to 1200, Chichen Itza was a military, cultural, and religious center for the Mayan, Toltec, and Itza people—all who influenced its architecture and life. 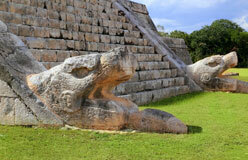 For hundreds of years, the elite of Chichen Itza ruled the Yucatan Peninsula. By around A.D. 1250, however, civil war among the different peoples had taken its toll, and the powerful city of Chichen Itza had fallen into decline.